** You will notice that there is no sealer shown for the Bounder and I believe that is because there are no caulked seams on the 1991 and newer Bounders. Prior to 1991 the body side panels were assembled in two sections (top half and bottom half) with a molding applied over the joining seam. 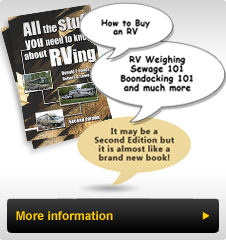 All exterior compartments on the early Bounders up to and including 1994, were installed with a sealer tape that is available at RV supply stores and dealers. Should you wish to caulk the seams around the wheel openings, lower body moldings, rear vertical moldings or any of the lamps mounted on the body, use the sealer that matches your body color. I have included the colors shown for other Fleetwood brands to make the task of identifying the appropriate color a little easier. Should you not be able to match the color, then the clear sealer shown above, under windows, should be used. I have had success with a clear Bath and Kitchen Silicone sealer on the body applications. Never use anything but the approved sealers on the rubber roof since the chemicals in many caulking compounds will rapidly deteriorate the rubber roof material. All sealers should be applied following the instructions on the tube utilizing a caulking gun. The surfaces must be clean, wax removed and for proper final finish you must use painters masking tape. Apply the tape *" on both sides of the seam to be caulked and cut the tube to give a proper sized bead. Apply the caulking evenly and if desired, use your finger (in a rubber glove) to squeeze the caulking into the seam and leave a smooth seal. Remove the tape immediately after you apply the sealer and you will have a proper seal that looks good. The key to the task is good preparation.